I returned a few days ago from giving a talk in the Program in Transnational Korean Studies at the University of California, San Diego. What a treat it was to get away from the deep freeze in Toronto (-24°C on the day I left) and bask for a few days in the warm Southern California sun. I gasped at the variety of fresh produce at a farmers’ market in posh historic neighbourhoods with impeccably manicured lawns and went jogging along the bustling path around the empty Silverlake Reservoir. I sipped overpriced cold brew coffee from hip cafés and shared delicious meals with old friends in Koreatown, Thai Town, and Highland Park. I was especially blown away at La Cevicheria, a new favourite. Sadly and typically, I traveled with a pile of work — student papers to grade and conference abstracts to submit, articles to revise and lectures to prepare — but Southern California was a welcome change of scenery. I had never visited UCSD before — now UC Merced remains the only UC campus I haven’t seen. 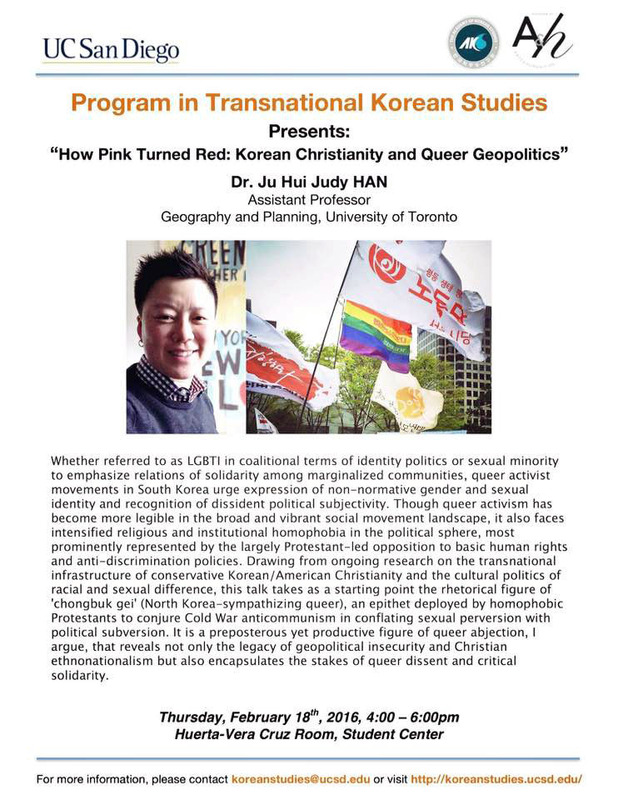 The talk I gave was titled “How Pink Turned Red: Korean Christianity and Queer Geopolitics,” and it’s a fuller version of a paper I gave at invited lectures and conferences at Harvard, UBC, OSU, York (Toronto), Barnard, and at EHESS in Paris last year. These talks have spawned three separate papers, actually: a Korean-language article that was published in Munhwa/Kwahak a few months ago, a forthcoming piece in Barnard’s The Scholar & Feminist Online, and a journal article I’m finishing up soon. Fantastic questions afterwards from UCSD faculty and students, many of whom are already engaged in queer studies and activism. I am presenting this talk once more at Binghamton University in early March, and then I’ll send it off for publication. Here’s the poster with a goofy picture. Abstract: Whether referred to as ‘LGBTI’ in coalitional terms of identity politics or ‘sexual minority’ to emphasize relations of solidarity among marginalized communities, queer activist movements in South Korea urge expression of non-normative gender and sexual identity and recognition of dissident political subjectivity. Though queer activism has become more legible in the broad and vibrant social movment landscape, it also faces intensified religious and institutional homophobia in the political sphere, most prominently represented by the largely Protestant-led opposition to basic human rights and anti-discrimination policies. Drawing from ongoing research on the transnational infrastructure of conservative Korean/American Christianity and the cultural politics of racial and sexual difference, this talk takes as a starting point the rhetorical figure of chongbuk gei 종북게이 (North Korea-sympathizing queer), an epithet deployed by homophobic Protestants to conjure Cold War anticommunism in conflating sexual perversion with political subversion. It is a preposterous yet productive figure of queer abjection, I argue, that reveals not only the legacy of geopolitical insecurity and Christian ethnonationalism but also encapsulates the stakes of queer dissent and critical solidarity.